It's been nearly three years since Death Stranding was announced at E3 2016 and we still know very little about the mysterious upcoming title from Kojima Productions. However, a panel at this year's Tribeca Film Festival may change that. 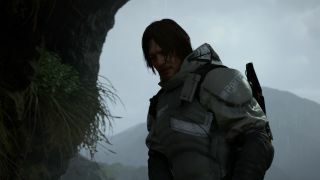 With Sony skipping E3 2019, we're hoping the panel will shed some light on Death Stranding's story, gameplay mechanics and when we will actually see the allusive title. However we're not holding out much hope. Kojima has been notoriously tight-lipped about the game, leaving fans and critics alike to speculate as to what the title is actually about. So far we know the cast includes Norman Reedus, voice-acting veteran Troy Baker as a mysterious villain called 'The Man in the Golden Mask', Hannibal’s Mads Mikkelsen, and director Guillermo Del Toro. We also know there's some weird business involving shadowy creatures, Norman Reedus transporting fetus' around the countryside and the game will explore life and death. To be honest, it's all a little strange. The panel is due to be held in the on April 25 at 6pm EDT as part of the Tribeca Film Festival in Manhattan, New York. However, tickets won't be available until March 26 (and don't expect them to be easy to come by).